Synchronicity brought me to Soulful Prairies. It is Linda Bruce’s support that keeps me there along with the amazing landscape and facilities that she has created. Every time I drive through the evergreens and come out on the other side, I feel that I am entering a little faerie tale world. It is amazing and has become my place of solitude. I had previously run sweat lodges in central Illinois. 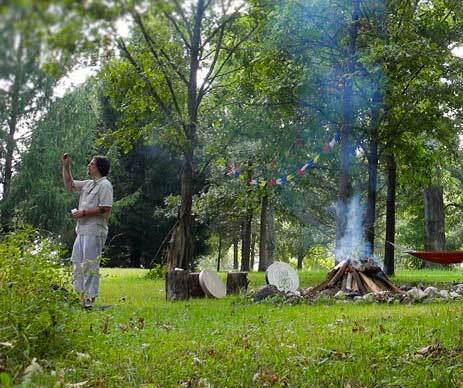 Just recently, I moved to the Woodstock area and my hope was to create a new sweat lodge. When driving on any country road, I was always looking for spots. “That would be a great location over there.” I would think to myself spying on some farmers wooded area as I zoomed by. “Oh, there are some good field stones I could use.” I’d wrench my neck looking into a cornfield while speeding by at 60mph. I had about 12 places memorized. Heaven forbid, I wasn’t really going to stop and ask someone if I could use their land, especially for a sweat lodge. I had returned back to Springfield to do a sweat. It was one of the last lodges I did there. Coincidently, a dear friend from over 30 years ago got ahold of me from my website and said that she and her friend Jan wanted to attend. I was excited and honored that they were taking the time to experience the lodge. It was a beautiful day and everything went perfectly. Afterward, they asked when the next lodge would be. Jan punched my arm. “You should check out my friend Linda Bruce’s place. She would totally let you build one on her land.” She gave me Linda’s number and I drove back to Woodstock. In the spring of 2018, I reached out to Linda. She immediately invited me out and with her friendly disposition showed me around the entire property. As we walked the land together and I experienced the details of Soulful Prairies I could feel I had landed in the right place. As we circled up towards the front of the property we ended up where the lodge is now. It was an indention in the pine trees that made up this old Christmas tree farm. The inlet was where some of the trees had been harvested and was now covered with thistle and prairie grass. “How about here?” She asked me as we stood looking over the brush and the land. I loved it yet my mind was grappling with how I would clear it and make it workable for a lodge. “I’ll clear it out,” Linda said looking right at me, smiling. She was wearing her old cowboy hat. I couldn’t have imagined meeting someone more supportive. “It’ll be done in a few days,” she added. “Plus, there’s a shed there where you can store your stuff.” It was a dream come true. As our friendship grew, I realized I had never experienced this type of support in moving a dream of mine forward. It wasn’t just the land either. She offered me personal thoughts on how to handle a few difficult situations and some business ideas too. This has been a wonderful experience. She really makes things happen. Once the lodge was up and running I had the opportunity to offer a lodge to Linda and our mutual friend, Jan, the woman who introduced us. It was one of those moments when you realize connections have their own mysterious way of working and we are not always privy to the inner workings of how and why things work out the way they do. There were some tears and a whole lot of laughs. It’s an honor to be at Soulful Prairies and to know Linda. She is what I would call a true friend.